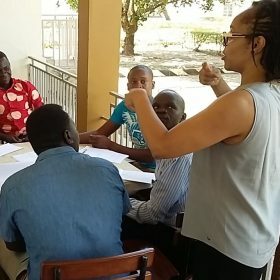 The roll out of the UNHCR’s NCD programme in Uganda began with an ambitious and action-packed ‘training of trainers’ course, driving 10 hours north from Kampala to the West Nile region. The lush green vegetation of the south gave way to the shrubs and drier lands of the north and, within an hour of our first sighting of the Nile, we arrived in Moyo. Moyo is relatively quiet town now. Clusters of huts with thatched roofs built from locally fired bricks is the typical architecture for both the nationals and aptly named ‘concerned populations’ in the settlements and villages scattered far and wide around the main towns of the West Nile – Adjumani, Moyo and Arua. Uganda’s approach to working with refugees is unique. They are welcomed, provided with land for the settlements and UNHCR, with its collaborating partners, work hand-in-hand with the national government. During our time in Moyo, we appreciated the sheer scale of the operations which sought to meet the needs of an influx of upwards of 800,000 refugees in less than 2 years, mostly from South Sudan and, more recently, from the DRC. Delivering much needed services therefore had to be fairly instantaneous with infrastructure having to play catch up. For health in particular, this meant that facilities were often tents, including accommodations for the health workers. Despite these challenging circumstances, rarely have we come across such dedicated and committed personnel. From the outset, the clinicians who attended the training were engaged and productive. They participated fully; sharing experiences and, very early on in the training week, began to think through how they could bring about changes to NCD care on return to their facilities. Our time in Moyo ended with some inspired NCD action plans which will be implemented over the next 12 months by our NCD champions with support and supervision from their respective UNHCR public health officers as well as PCI. A two-day break in Kampala gave us the opportunity to meet with and share the details of the training with enthusiastic UNHCR implementing partners whose remit was health service delivery. We then travelled south to the picturesque hills of the South West region passing by Lake Victoria and across the equator on the way. Mbarara is the second biggest city in Uganda and colder than Moyo. Refugee settlements here are much older than in the north, one of them dating back to 1958 with long established amenities that one would expect in a town. We noticed endless plantations of the carbohydrate staple ‘matoke’ a variation of the banana enjoyed by nationals and refugees alike and which featured prominently in the proposed dietary plans for diabetic patients designed by our trainees. The clinicians, supported by their highly experienced and motivated UNHCR public health officers, were exemplary in their engagement with the training. Once again demonstrating a keen desire to apply much of what has been gained by developing practical solutions for NCD care for their populations. We look forward to seeing how they roll-out their proposed action plans over the next 12 months. Although our time in Uganda had to come to an end for now, there will be a follow-up visit halfway through the project to see how our NCD champions are getting on. We’ll be supporting the team with implementation challenges and supporting them in monitoring and evidencing progress. I have no doubt that despite the difficult circumstances in which our colleagues work, there will be changes!